MARIPOSA, Calif. -- The town of Mariposa, with its century-old saloons and covered sidewalks, normally bustles with summer visitors on their way to Yosemite National Park but on Thursday the Gold Rush-era hamlet was mostly empty as ash rained down and heavy smoke from a nearby blaze darkened the sky. 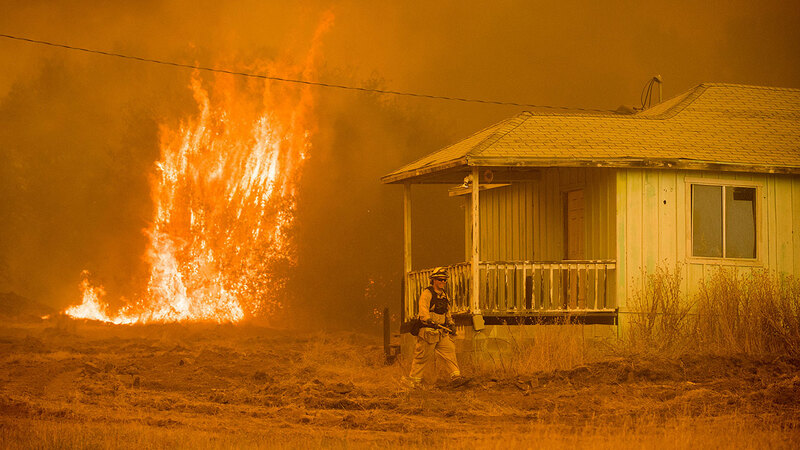 The five-day-old blaze in the Sierra Nevada foothills threatened hundreds of homes and historic buildings, including a wood courthouse founded in 1854 and touted as the oldest active courthouse west of the Rocky Mountains. The fire did not grow as significantly Thursday as it had earlier in the week, but state fire officials revealed late in the day that 99 structures have now been destroyed, 50 of them homes. Eleven homes and five other structures have been damaged. The wildfire has scorched 109 square miles (282 square kilometers), threatening at least 1,500 homes. About 35 miles southwest of the park, Mariposa's charming main street has covered sidewalks and historic wood and brick buildings that now house antique shops, restaurants, pizza parlors and art galleries, offering a taste of the Gold Rush days. Carol Dewey, who owns a small bed and breakfast in downtown Mariposa, was one of several business owners allowed in Thursday to check on their shops in the town under mandatory evacuation. "The place is like a ghost town," Dewey said. "This fire has really devastated the area, business is just flat." Dewey, 64, said in recent years people in their 30s have opened several new businesses and wine bars, attracting lots of young tourists. Now, they stand empty as firefighters try to keep the flames away from the town of 2,000 residents. More than 3,000 firefighters are battling the blaze that has forced almost 5,000 people from homes in and around a half-dozen small communities. It is 10 percent contained. Only fire trucks and other emergency vehicles traveled Thursday on Highway 140, the main road to Yosemite National Park and the town's main street. "We just hope everything gets back to normal by next week," she said. The fire came within a half-mile of Mariposa but crews have been able to keep it out of the town by dropping red retardant on the flames burning on nearby slopes and using bulldozers and hand crews to build fire brakes, said Cal Fire spokesman Jason Motta. "We saw the fire come over the ridge on the north side of Mariposa and it crested the ridge just at sundown" when it was cooling down, Motta said, adding the lower temperatures helped fire crews stop the wildfire's progress. "The imminent threat to Mariposa is over but fire crews are maintaining the line to control the threat," he said. At its closest, the blaze was still about 35 miles (56 kilometers) from the boundary of Yosemite, where campgrounds are open, park spokesman Scott Gediman said. The fire closed one of several roads into the park during its busy summer season, and rangers warned visitors with respiratory problems to be mindful of the smoky haze over the park's landmark Half Dome rock face, Gediman said. Yosemite does not appear at risk from the fire, which was moving south, away from the park, Motta said. Record rain and snowfall in the mountains this winter abruptly ended California's five-year drought. But that has increased the challenge for crews battling flames feeding on dense vegetation. Statewide, about 6,000 firefighters were battling 17 wildfires, including about 2,200 at the fire near Yosemite. Gov. Jerry Brown has declared an emergency, bolstering the state's resources to battle the fire.